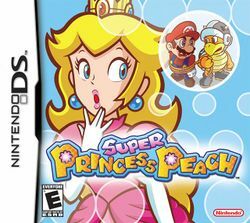 Super Princess Peach is a platformer title for the Nintendo DS. The game roles of the characters are reversed with Mario, Luigi and the Toads kidnapped by Bowser who has the Vibe Scepter from Vibe Island. This page was last edited on 16 December 2017, at 01:42.